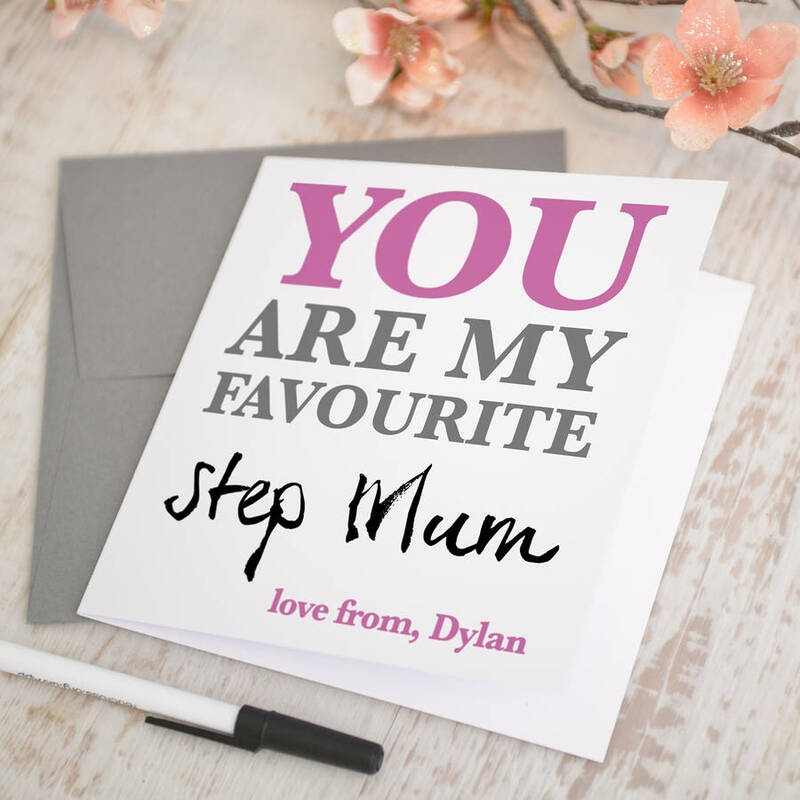 A personalised and stylish card for a step mum, perfect for Mother's Day or just to show how much you appreciate your step mum. You can add text below, for example 'love from, Dylan' so your step mum can see that it's from you. 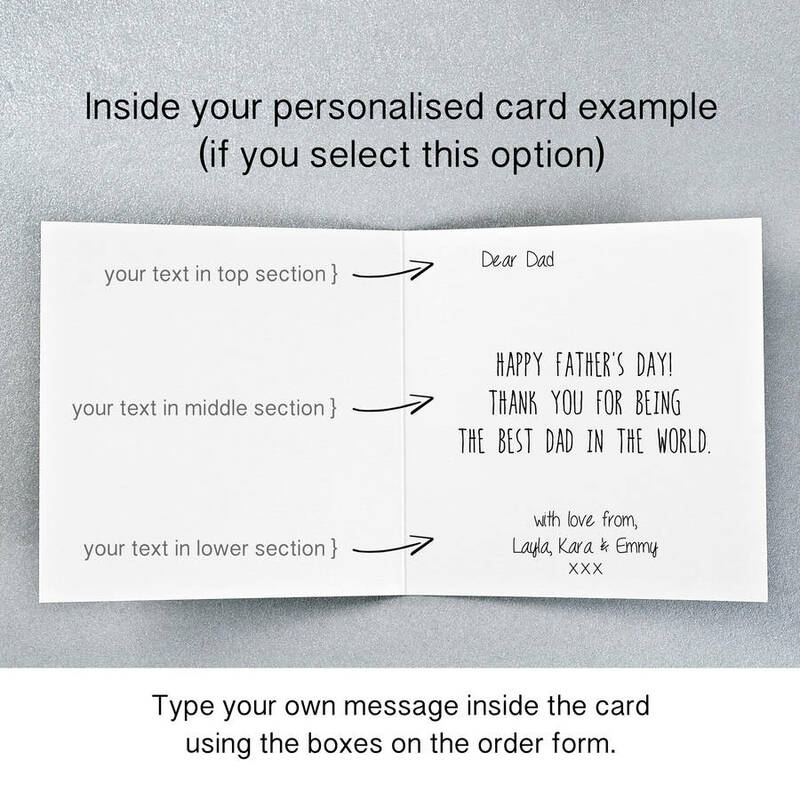 We also offer an option for you to add a personalised message within the card and for this option we have three areas for you to select, the top section, middle section and the lower section (see example). If you do not select the option to personalise the inside of your card, it will be left blank. If you opt for the personalised message inside the card, you can then choose to have the card posted directly to the recipient or to you to post yourself or hand deliver. Delivery to you: Your card and envelope will be placed in a cello bag and then placed in a rigid card postal envelope and sent via Royal Mail 1st Class post, on receipt you can fill in your card, place it in the envelope and post it to the recipient. Delivery directly to the recepient: If you select this option you will also need to select the personalised message option and we will then print your personalised message in the card, place it in the envelope and send it by Royal Mail 1st Class post to the delivery address you have provided at checkout (recipient's address). We DO NOT charge extra postage for your card to be sent directly to recipient. Cards are printed onto 300gsm high quality card and are supplied with a quality white envelope.